All the manipulator operators try to achieve minimum cost of their operations. One of the possibilities how to save money in repairing the manipulators is to purchase fully functional used spare parts. Such parts allow more than 50% saving when compared with new parts and are also environment friendly, because the environment is not damaged by production of a new part. We specialise in the used Merlo parts. All parts are checked by qualified personnel and are ready for immediate installation. In the below summary (table) we provide the up-to-date offer. The parts are delivered as they are specified in the offer. The prices are quoted in EUR exclusive of VAT and exclusive of freight. We can ensure transport to your company by the DHL or UPS couriers, cash on delivery. 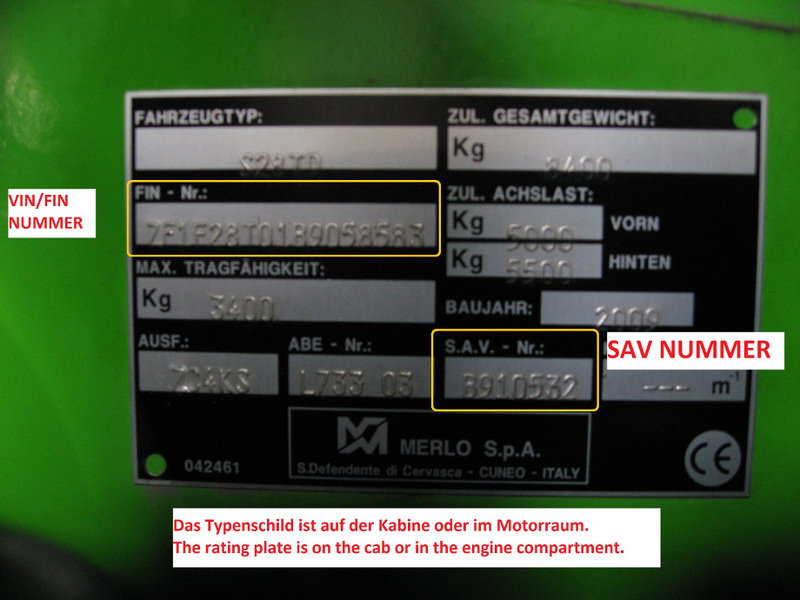 If you do not have spare parts catalog, send us the "VIN" and "SAV" number of your machine Merlo and description of the part or the photo. 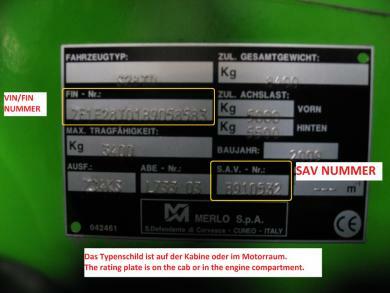 Tag this data is located on the cab or in the engine compartment - viz. Image. If you have not found the part you need we make you an offer on a new part. We also supply new parts SAUER for attractive prices.